Campfire cooking is a classic camping activity. Listed here are several campfire recipes which hopefully will inspire your camping cooking creativity. Share your favourite camping recipes – cause everyone loves a new idea! Remember that camp fire cooking is a high heat cooking. You generally can’t cook slow cooking meals such as rice on a campfire because it needs a low constant temperature, which a campfire can’t require. Hot dogs, Smokeys, Sausage and Spider dogs! - Use a pointed stick or opened coat hanger wire (with the outer plastic coating burned off) and stick through the end of the sausage. - To make camp fire cooking even more fun with the dogs, make spider dogs by cutting each end about 1-2 inches. - Make sure not to forget buns, condiments such as ketchup, relish, mustard, cheese, onions. - open the can of baked beans so that the lid can open and close. - Place can directly on the fire or coals. Further from the hot heat is better as it prevents burning. Stir with a small spoon or a clean stick (if you really want to be ‘woodsy’). - Use tongs to retrieve your can. - Eat your beans with spider dogs! - Classic grilled campfire cooking food. - Standard burger toppings: cheese, tomato, lettuce (a few leafs), ketchup, mustard, relish, mayonnaise. - Spectacular burger toppings: avocado, caramelized onions, bacon, grilled peppers, grilled zucchini, delectable cheeses such as gouda. - A great (and easy way) to cook corn over a campfire is by soaking the corn and husk in water. - Place the soaked corn (with husk) directly on the fire or coals and let it cook. - The outside husks will eventually burn (not all the way through), while the corn will steam inside the husk, making delicious corn. - Wait until the outside husks are turning brown/black, and then check the corns periodically by opening the end with tongs and a glove to see when the corns are finished. - if you’re into fishing, then you can eat your freshly caught fish from the fire. - Filet your fish and cut in half along the spine to keep the fish pieces thin. - Lay the fish on a grill that is over coals, or lay the fish carefully on a hot rock. If you’re interested in more supper and campfire cooking recipes, check out my wilderness cookbook. You can purchase popcorn that is packaged in pie tins, specifically for camp fire cooking and camping. Cook this over a campfire, and snack to shooting stars. A real-life light show. - Ingredients: Graham crackers, marshmallows, chocolate squares (or chocolate covered graham crackers), roasting stick. - Roast marshmallow (or 2) with the campfire until the outside is golden. - Smush marshmallows between 2 graham crackers and chocolate square. - A first evening dessert for camp fire cooking . - Ingredients: Banana, chocolate chips, mini marshmallows (or cut larger ones on trip), tin foil, tongs. - Slice banana from tip to tip without going all the way through the skin on the other side. - Open up banana and fill with chocolate chips and marshmallows. - Wrap banana in tin foil (best done if wrapped and folded at top for easy opening. - Place on rack on fire, or on rock beside fire. - Wait until chocolate chips are melted. 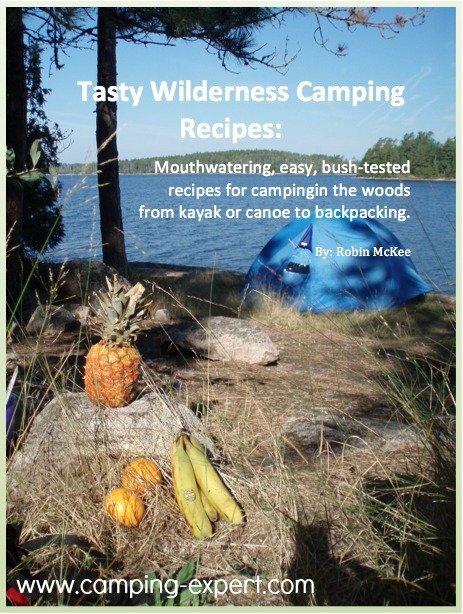 If you liked these campfire recipes, and want more recipe ideas, check out my backpacking recipes book. Do You Have A Favourite Campfire Recipe? Do you have a great campfire recipe? Share it! Campfire safety – entertaining stories to remember important safety rules when campfire cooking. Learn which Camping / Backpacking Pots I recommend, and also which stove that I personally use and why. Backpacking recipe book – more great recipe ideas.